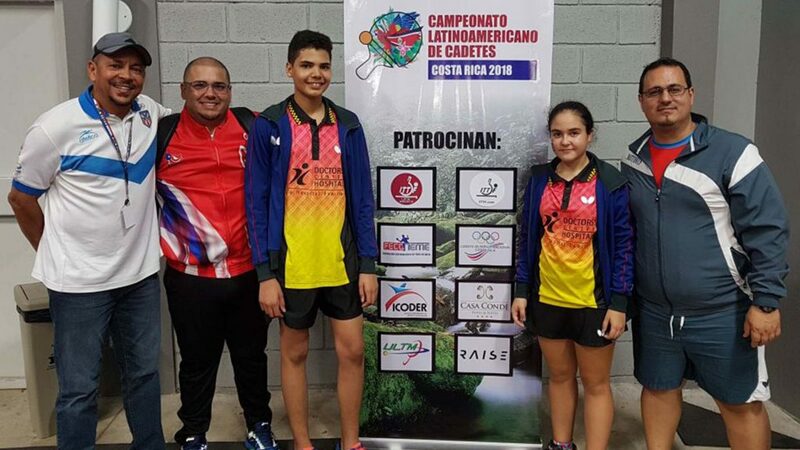 The champions decided but at the 2018 Latin American Cadet Championships staged in San José, Costa Rica; that was not the end of matters, as ever year there is one extra day. If you are parent or coach, it is torture; if a player agony or ecstasy. On Sunday 12th August, the places in the Latin American Team to compete in the forthcoming ITTF World Cadet Challenge were finalised. One day earlier, Panama’s Jacobo Vahnish had beaten Peru’s Carlos Fernandez in the final of the Boys’ Singles event (11-8, 5-11, 6-11, 11-5, 15-13); having reached the final both gained selection. Similarly Brazil’s Giulia Takahashi and Mexico’s Arantxa Cossion Aceves had contested the Girls’ Singles final. Thus they were automatically selected; Giulia Takahashi emerging as the champion (11-6, 11-5, 11-6). Therefore, two places were on offer to complete the four members of each of team; the quarter-finalists in each of the Boys’ Singles and Girls’ Singles events, the previous day were called to order but with one added proviso. A national association is only permitted one player in each team. Two knock-out tournaments were staged; the national association with the greatest reason to celebrate was Puerto Rico, both Angel Naranjo and Brianna Burgos reserved their places. Angel Naranjo won the first Boys’ Singles knock-out event; after accounting for Argentina’s Lautaro Sato (11-5, 11-4, 11-9), he beat Chile’s Jeremias Paredes (11-4, 13-15, 11-4, 12-10) to reserve his team place. Somewhat differently for Brianna Burgos, in the Girls’ Singles event, in the first knock-out tournament, she had reached the final, losing to Colombia’s Juliana Rodriguez (11-3, 11-3, 9-11, 11-6), the narrow winner in the previous round against Chile’s Macarena Montecino (11-8, 11-8, 7-11, 7-11, 11-9). A second chance for both Brianna Burgos and Macarena Montecino; the Puerto Rican seized the opportunity. She beat Macarena Montecino in a contest that was closer than the straight games score line may suggest; each game decided by the minimal two point margin (11-9, 12-10, 11-9). Places for Colombia and Puerto Rico; there was also success for the hosts; Alfredo Sanchez brought tears of joy to Costa Rican eyes. In the second Boys’ Singles event, in dramatic fashion he beat Lautaro Sato in five games (11-6, 9-11, 11-9, 9-11, 11-5), before by the very narrowest of margins booking his team place courtesy of success against Chile’s Jeremias Paredes (11-3, 11-4, 9-11, 9-11, 16-14). “I am so proud the dream came true, this is the reward for the effort, the hours training and having the necessary patience to improve and progress. Incredibly close games; thanks to God I had a little more patience, I was able tp concentrate and win.” Alfredo Sanchez. Notably Puerto Rico is the one national association represented in both Latin American Boys’ Team and Girls’ Team.